The theme of this year’s Designer Show House Santa Fe is “Reinventing Western Classics” which is perfect because this residence is not only a Western classic, it’s a Western classic that has been reinvented at least twice since coming into existence sometime in the late 1700’s. Known as the Frank Applegate Estate, it’s an original adobe that was built as an 18th century fortress before being bought in 1845 by Sergeant Francisco de la Pena, a soldier in the Mexican army who’d fought at the battle of the Alamo not ten years earlier. De la Pena purchased the residence for a whopping $114.00 and renovated/reinvented the house for He and his wife and eight children. Frank Applegate, an artist from Illinois who met Picasso, Cezanne and Matisse in his twenties and eschewed a prestigious teaching position in England where he studied Indian clays of the southwest, purchased the residence in the 1920s from two of de la Pena’s daughters. He wanted to be close to where the “Cinco Pintores” (Santa Fe and Taos’s five young painters) who settled on and around Camino del Monte Sol. Applegate was credited for establishing Santa Fe’s historic conservation movement and went about to preserve and reinvent the residence adding bedrooms, a garage, living areas and a second story, using the beams and portal from the ground floor, and reconfiguring the house into a U shape — with the portal now at the head of the front courtyard. Gerald Peters, a Santa Fe business man and his wife Katie bought the estate in the mid 1980s where they raised their four children. Determined to retain the history of the estate, they removed the 20th century staircase in the 18th century dining room, rebuilt and preserved the fireplaces to their original design, added traditional pine floors and retained one of the most historically significant details of de la Pena’s time — the shepherd’s bed. These beds were raised adobe platforms, located outdoors that served as the shepherd’s sleeping platform. Heat from a Kiva fireplace across from the bed flowed beneath the platform keeping the platform warm. 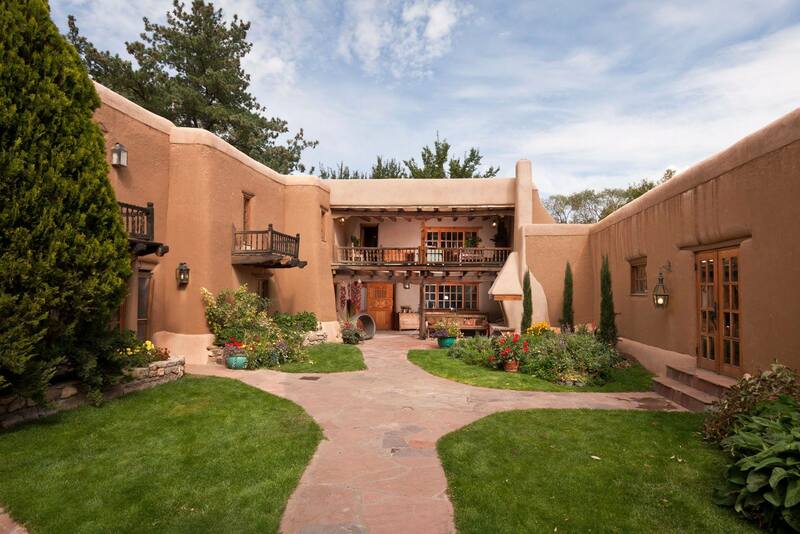 Today, this tree lined compound of six bedrooms and seven bathrooms exemplifies everything that makes a classic Santa Fe home: Western, adobe, historic and always more than ready to accommodate the new, the interesting, the unexpected. Stivers and Smith Interiors will be reinventing the Library and connected Sleeping Portal in the Frank.Applegate Estate using this year’s Show House theme of” Luxe New Mex.” Please follow us in this journey of transforming our space in this fabulous historic estate.